The (vegan) Soup Post! My Tips & a Recipe Roundup. I skip over the cold, dusty cobblestone streets, an icy whistling breeze chases me as my feet stumble through crinkly gold remnants of smashed fallen leaves. Glowing lights from the shops look like little lanterns of warmth. I pass them and scurry at a quicker pace. It's dark. Cold. Damp. Quiet. But I secretly love it, since my hot steamy soup pot is calling me home. Here it is! My (vegan) Soup Post. I've included links to my personal favorite recipes, tips and even a soup recipe roundup from a few vegan bloggers. Soup: it's calling you home.. Cold Nights. Hot Soup. Sometimes I really miss year-round warmth - the kind I grew up with in California. But then I put on a snugly sweater, turn up the heat, sip some hot cocoa or make a big, bubbly pot of steaming hot soup. And all the sudden coming in from the cold isn't so bad after all. 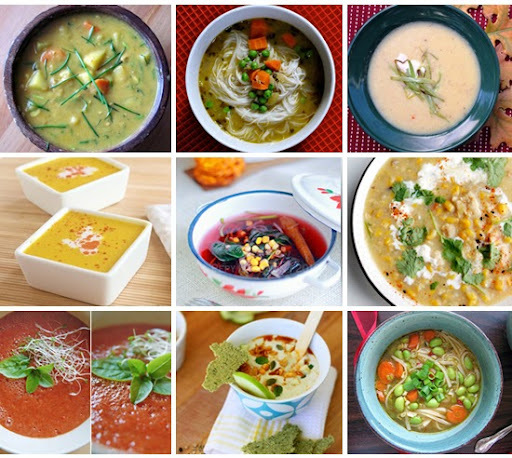 *my soup photos from PCRM's Vegan Kickstart IPhone App. App info. 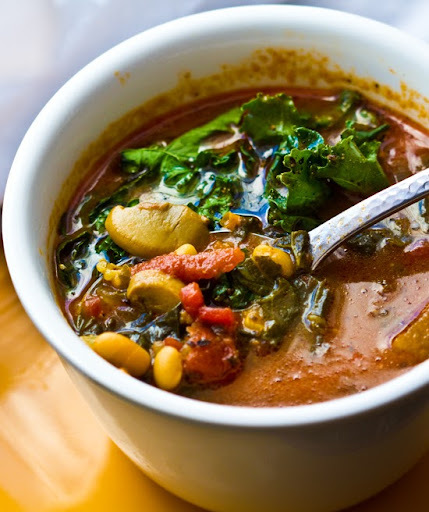 * a new recipe from me "Roasted Tomato, Kale Bean Soup"
Adds a unique, savory, rustic flavor to your homemade soups. Simply add in a bay leaf as the ingredients simmer away. This may be obvious to you soup-experts out there - but I remember the very first time I used a bay leaf in my soup - I was amazed by the increase in flavor. One bay leaf goes a long way..
2. Add a dash.. of Cayenne. I add a dash of cayenne to almost all my soups. It gives a warm buzzing flavor. Cayenne is a dry, pure, warm spice. When added in small amounts, it isn't overbearing to delicate flavors. 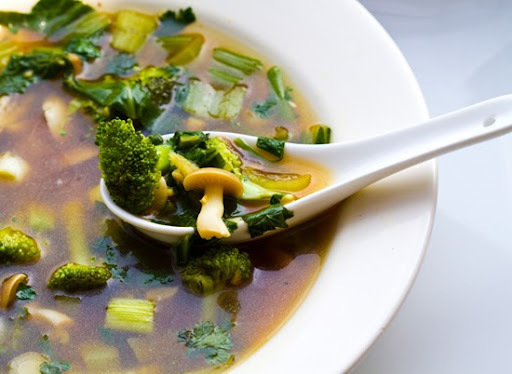 Add a dash to give your soup a kick! I love to have vegan bouillon cubes in my pantry because I can use them in place of veggie broth (just add water) - or I can use one to add extra flavor to virtually any broth recipe. I like Rapunzel brand cubes. Dry spices and seasonings are fantastic. But fresh herbs will add an elegant dose of gourmet flavor to your soups. Whether you are herb-roasting root veggies to puree or adding fresh herbs as a garnish - the aromatic layers of flavor from fresh herbs are unique and prized. Try sage, rosemary, oregano, thyme, marjoram, mint, parsley, cilantro or dill. If you want to bring out some seriously intense, caramelized flavors in your veggies before adding them to your soup: roast them! You can roast yams, onions, carrots, potatoes, squash, broccoli, cauliflower and more. Use dry beans and soak them overnight - instead of canned. Dry beans can be less mushy and more flavorful. 7. Slow and Low Wins the Race. Simmer on low. Simmer on low. Simmer on low. Whenever I'm making soup, I think "WWGD" ...What Would Grandma Do? She'd simmer her soup low and long until the flavors were perfect. Give soup time to reduce - let the steam boil off and allow the flavors to mesh. Plus, a low boil is gentler on you ingredients than high heat. So if you have the time, simmer it long and low. 8. Instant Flavor Booster #1: Vegan Sausage. I have a few instant flavor boosters I add to soup. One of my favorite tricks is to add one vegan Field Roast brand vegan sausage to my soup. It adds so much flavor and even a nice dose of protein. 9. Instant Flavor booster #2: Salsa! 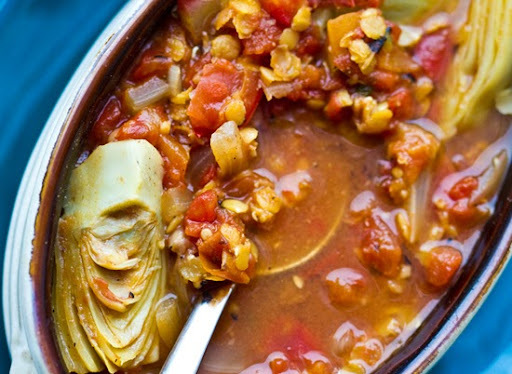 If I am making a veggie tomato-base soup, I love adding in chunky salsa. This is a great way to use up those half-used bottles of salsa in your fridge. 10. Get Fancy: Use the Good Stuff. High quality ingredients can make your soup sing. Sometimes one star ingredient is all you need to make a really fantastic soup. Whether it's a bunch of stunning carrots from the Farmer's Market, a hearty pinch of saffron, a dash of your mom's special curry blend or an exotic pink sea salt - give your soup something fancy. Remember to make sure your dry spices are fresh. Seal spice jars/bags tightly to prevent oxidation. 12. Leafy Greens Can Go Last! I like to add in chopped leafy greens like kale, spinach, chard - last -right before I serve my soup - so that the veggies stay tender instead of mushy and overcooked. 13. Get Creative with Grains and more. Plain old pasta can be a bore. Make things interesting by adding creative grain alternatives like: kamut pasta, Israeli couscous, whole wheat couscous, farro pasta, brown rice pasta, red lentils, quinoa, red quinoa, barley, millet and more to your soups. My Favorite Soup Recipe Posts. 3) Recipe Round-up! Recipes from FindingVegan.com (my new site) that caught my eye. 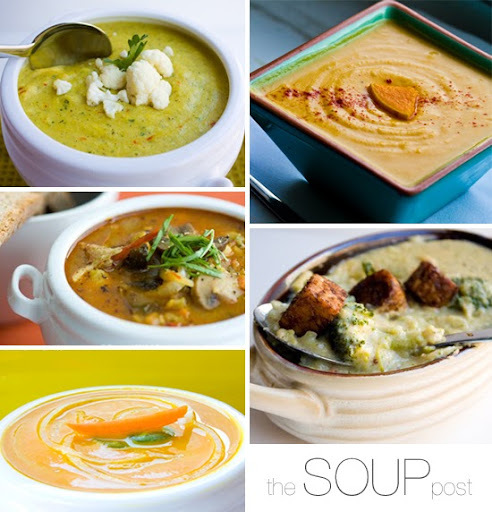 You can also browse all FV's soups with the #SOUP tag. Vegan Soup Recipes pictured above (from left to right)..
1 Field Roast Sausage, Spicy Chipotle, sliced. I add everything to my soup pot except for half the portion of kale. Simmer for at least 45 minutes. Right before I serve the soup, I add in the remaining kale and let it wilt in the hot soup so it is just tender.